I thought it would be informative to give people an idea of how our days are spent. As I have said before, we are not touring all over the country doing the touristy thing most of the time. We are doing the same things people do all over the world every day. Just living. 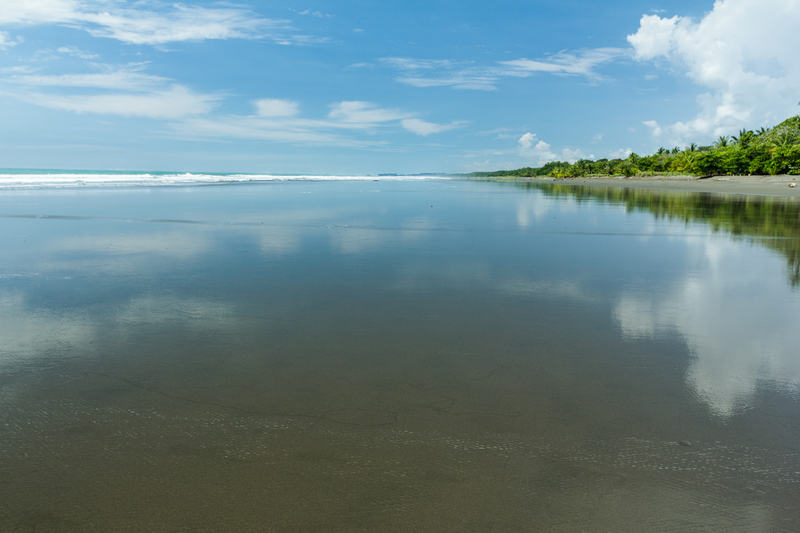 In a beautiful place with amazing wildlife and the ocean 50 paces away, but just living. Everyday starts the same way, we get up and head out the door to take Omber for his morning walk. Most days this consists of a run up the beach. The biggest decision is which direction to go. After our run we settle down to the business of enjoying a pot of coffee and “working” on the internet. Karen pursues the house sitting sites to look for future jobs and I play with my photographs. 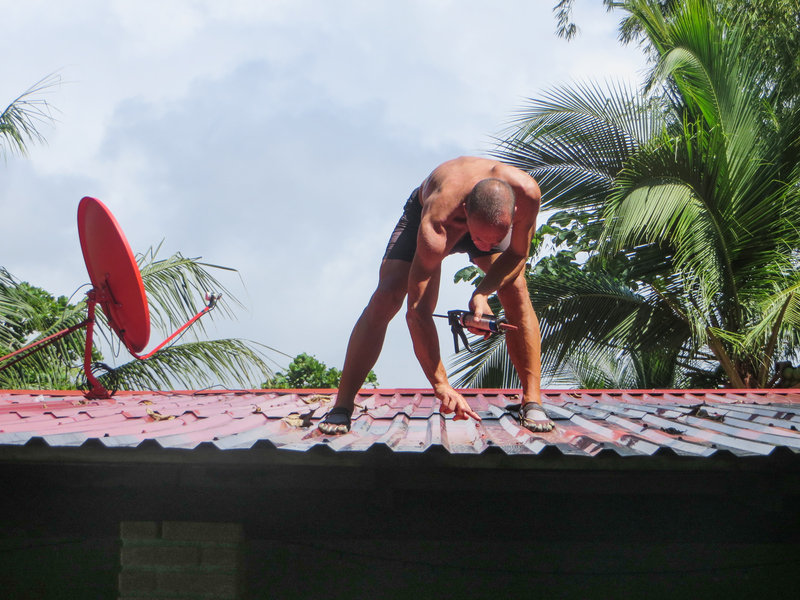 The first 7 weeks here were very frustrating as the internet connection was incredibly intermittent and data costs were incredibly high. We were able to solve both problems. We opened an account with the ICE office which allowed us unlimited data for $32US a month. The connection problem was solved when I heard some friends mention they got excellent reception in the hills. 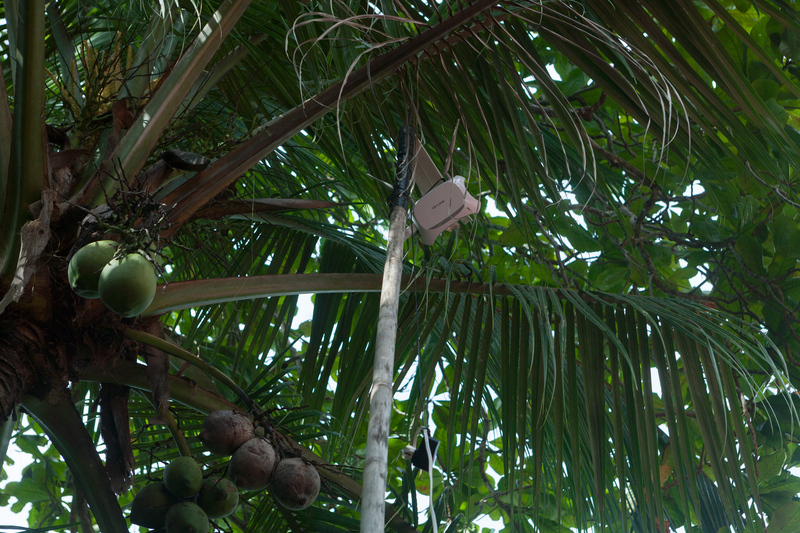 So with the use of a long bamboo pole I increased our elevation by about 25ft and “Voila” reception is excellent and we can now upload and down load videos and photographs with ease. Follow the pole in the centre of the picture upward. Nestled safety in the palm tree. Our morning coffee time is the best time of day for enjoying the wildlife as well. Either the birds or the monkeys usually pay us a visit sometime during coffee. 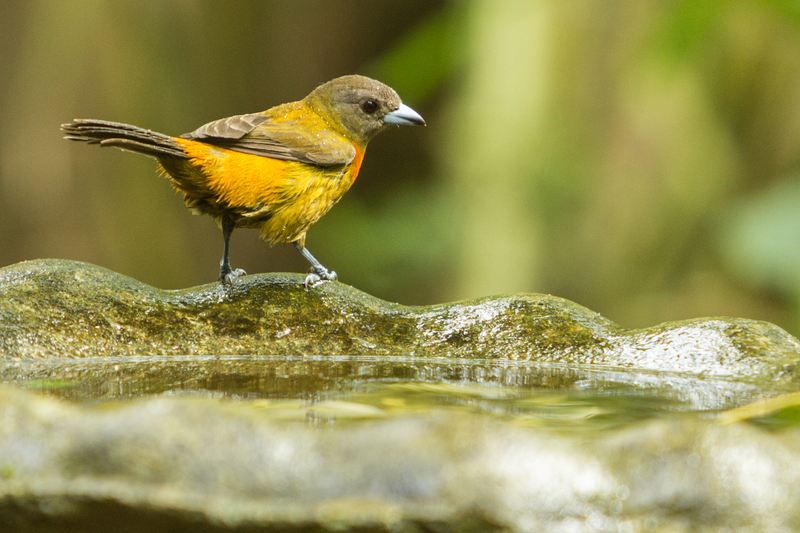 A female Tanager in the bird bath. 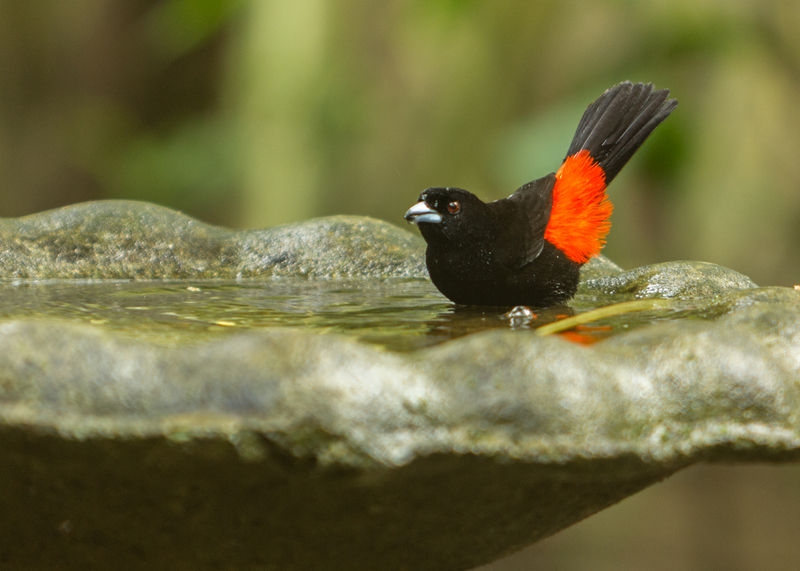 The male Tanager has a dip once the female leaves. 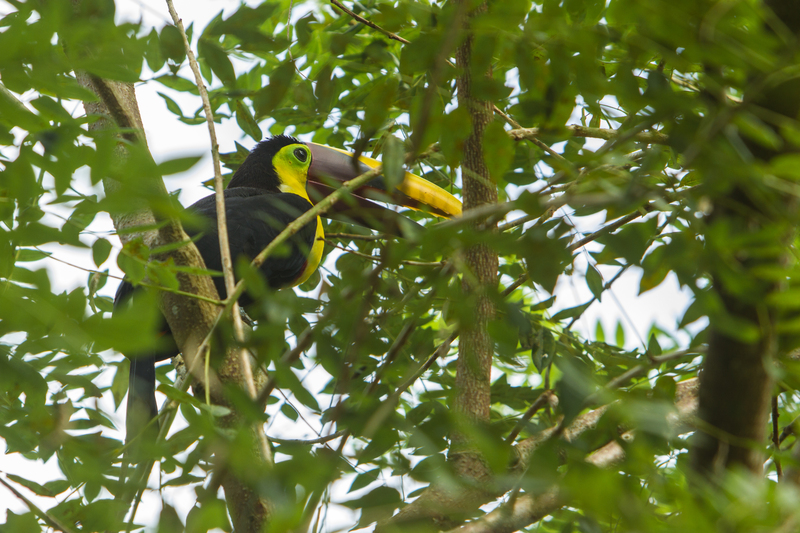 A Toucan came to visit one day, very cool. 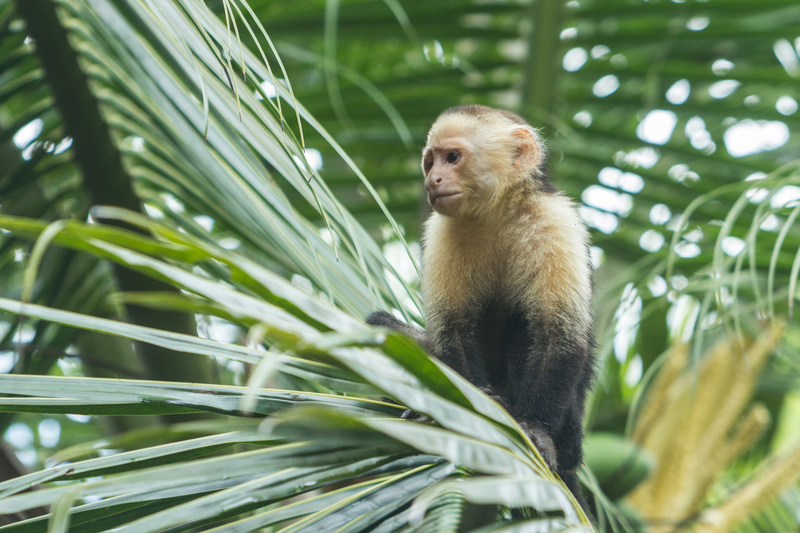 And of course the Capuchin monkeys. A troupe of them will take about an hour to move through the yard. Every day brings different sights when we are out for our morning runs or afternoon walks. Even though the location is the same the sights change daily. 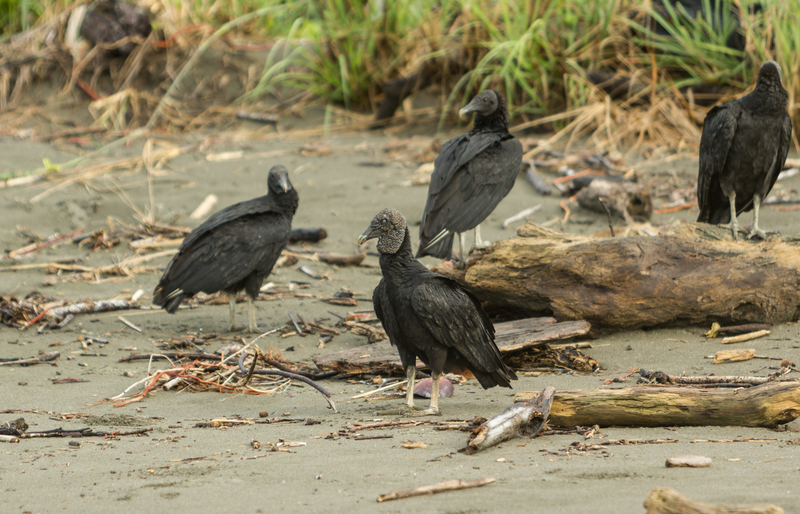 Black Vultures are out nearly every day keeping the beach clean. 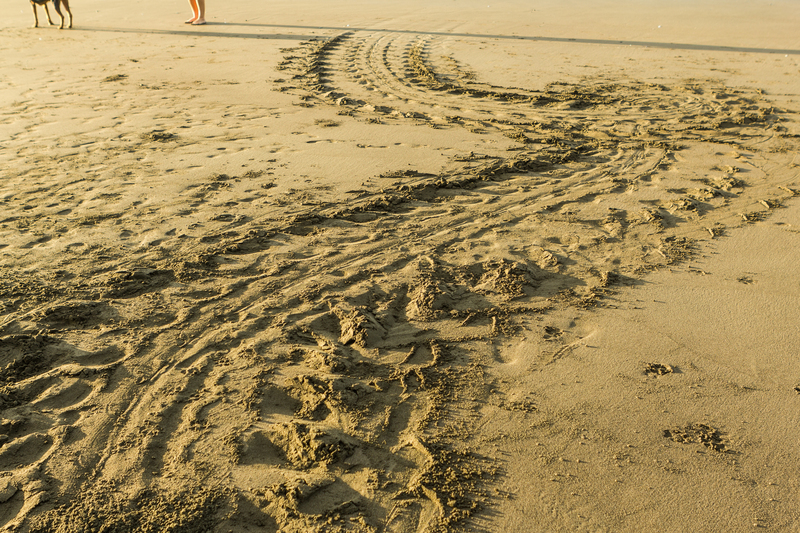 Many mornings we will come across tracks where turtles have come up on the beach during the night to lay their eggs. It is always entertaining to watch Omber in his never ending pursuit to try and catch a bird when we are out on the beach. I am not quite sure he would know what to do if he ever caught a vulture. Of course staying in a house in this climate also entails a certain amount of maintenance. Never something I was a big fan of previously. I find I quite enjoy the challenge of figuring out how to best deal with the different challenges of dealing with maintenance due to excessive heat and moisture. As well as the simple task of keeping the yard looking tidy. The amount of debris that accumulates in one week here is more than what I ever dealt with in a year in Canada. Karen and I rake and tidy the yard a couple of times a week and the only way of dealing with the debris is burning. As I have learned there is a process for that as well. Unless you want your neighbours very angry with you, you do not burn during the day. One must wait until sometime between 5:00 and 7:00pm for the wind to shift so all the smoke is blowing out to sea. Spent some time sealing every screw that had been used to secure the metal roof on. A job that was much more enjoyable in the shade. 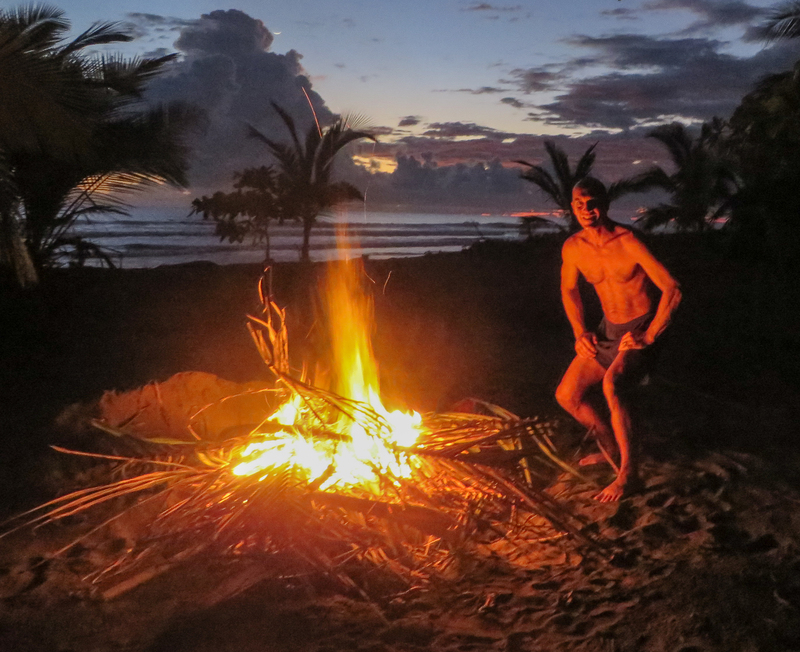 A little fire on the beach to get rid of dead palm fronds, bamboo leaves, and coconuts. Replacing a tap that had broken due to metal fatigue in the outdoor shower. 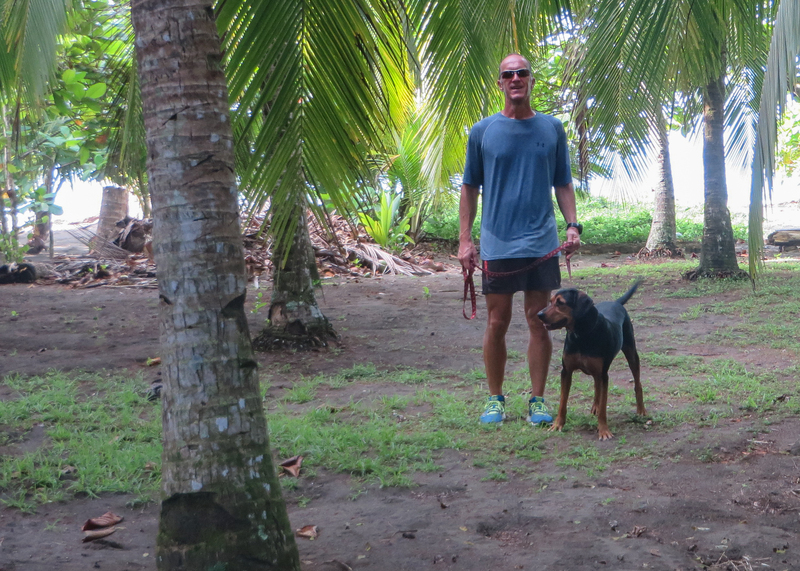 Returning from a run up the beach with Omber. He’s a great dog to run with. 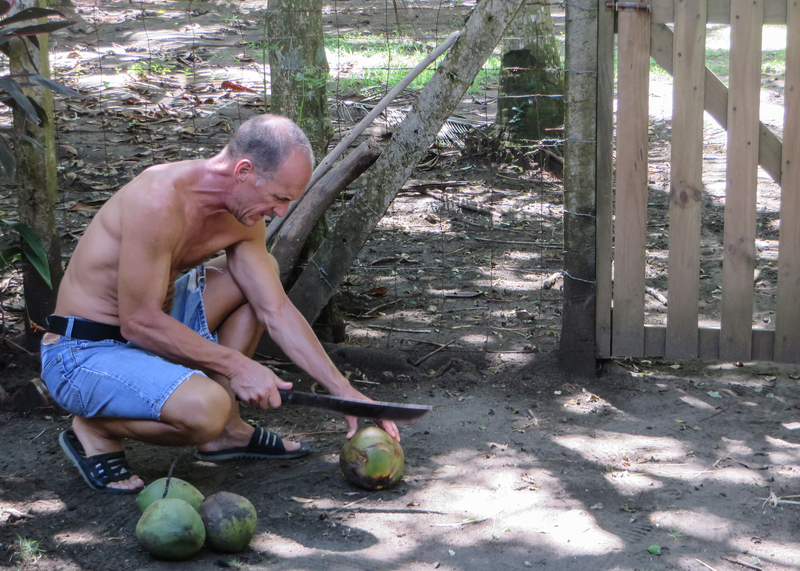 Learning how to open a coconut with a machete. Yes, I still have all my fingers. Enjoying the fruits of my labours. 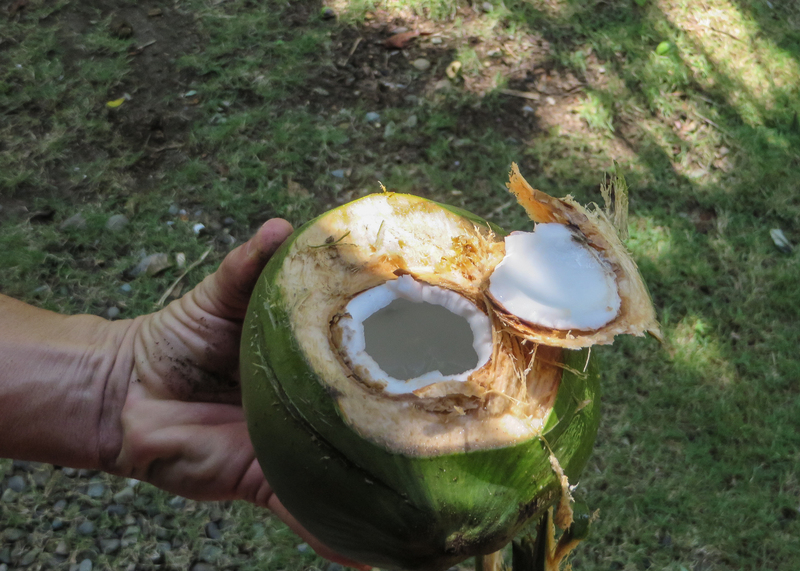 Refreshing coconut water. What makes working around the yard so enjoyable is that there is no rush to it. 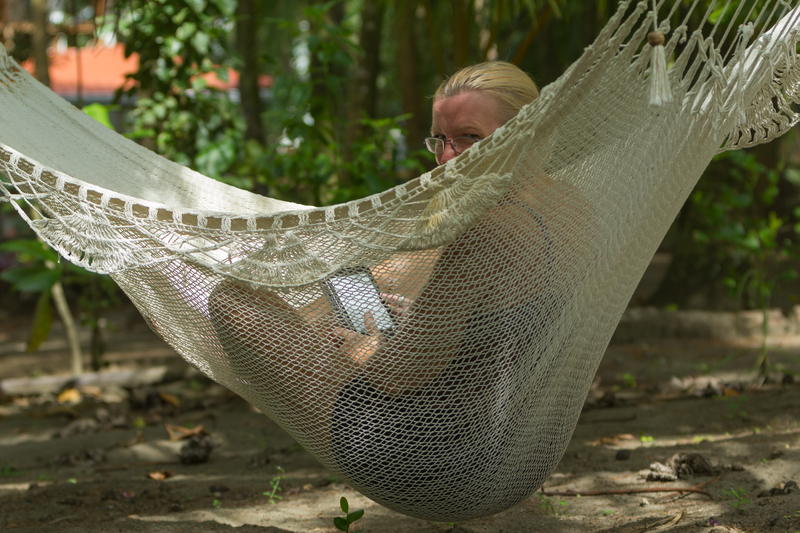 If you don’t feel like it one day you just read in a hammock and consider doing the work the next day. It all gets done eventually and there is simply no deadline stress to it. Rather like most things should be I believe. Sometimes you just need to enjoy a good book and the ocean breeze in a hammock. There are some negative things in our daily activities. We have learned that nothing can be left out at night. Both Karen and I have had two pairs of sandals stolen from the deck overnight. Apparently we are slow learners and didn’t start bringing them in until after the second pair were stolen. 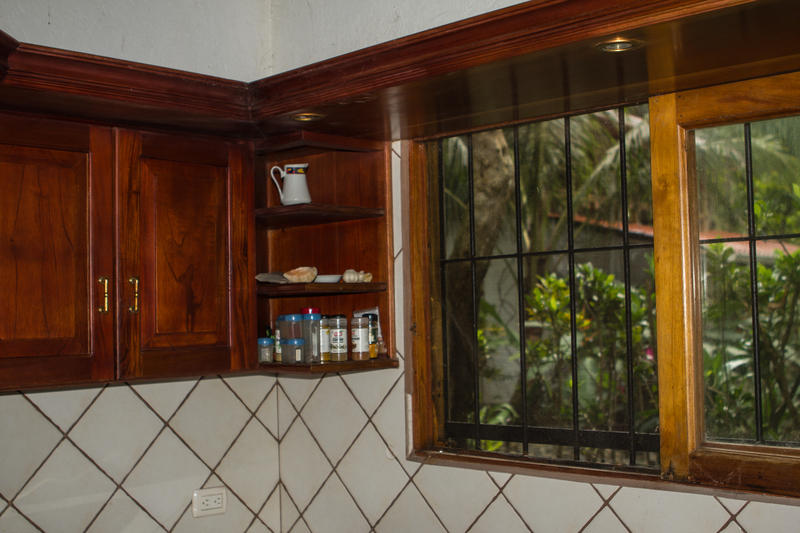 We also had a thief reach in through the bars on the kitchen window a steal some spices, soap, and a scrub pad. At least the thieve’s dishes will be clean after they cook a tasty meal. This is where the thief reached through and stole items off the shelf. When it comes to travelling around the area we generally walk or I’ll ride into Matapalo if we need something from the store. For longer trips into neighbouring towns we use the bus service. It is clean, and comfortable, you just have to be sure of the times or get to the bus stop early to avoid missing it if it happens to come a bit ahead of schedule. 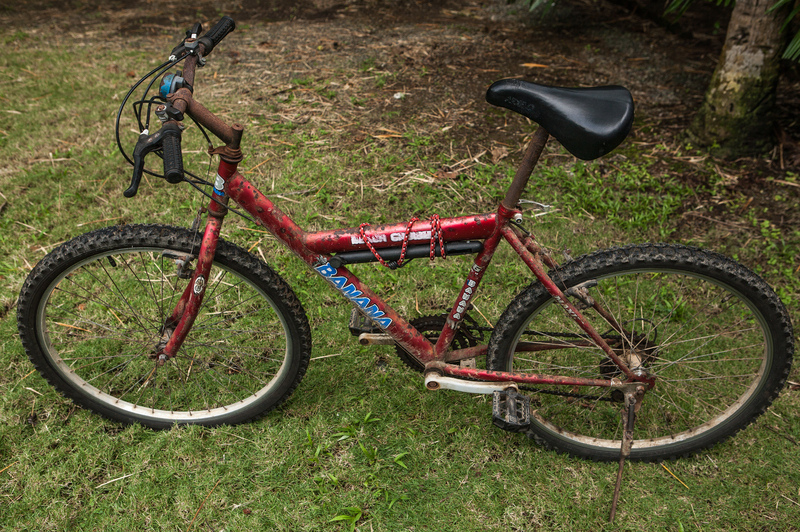 Great bike for quick trips into town. 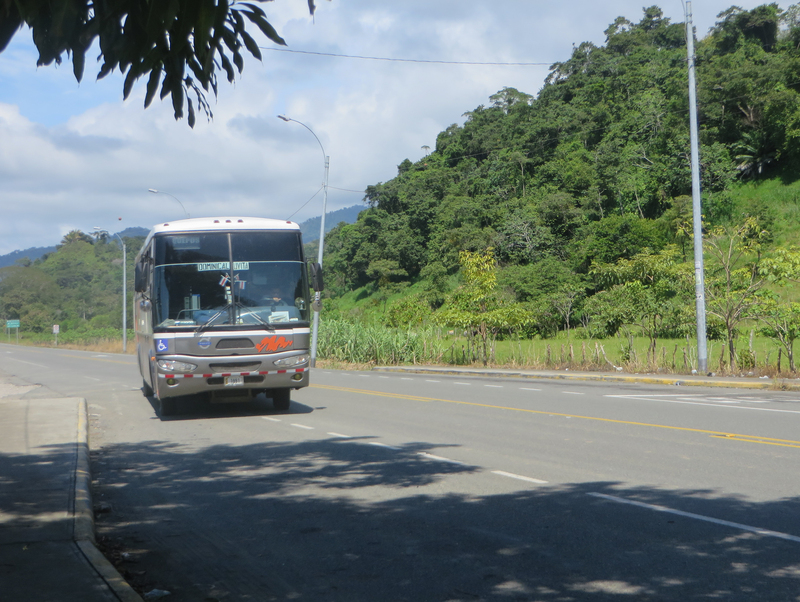 Our bus arriving to take us to Dominical. One of the previous house sitters at this property built a barbecue in the yard. We thought it would be a good idea to cook our Christmas chicken over the barbecue. To lower our stress level we did a pork loin the week before and it turned out fantastic, as did the chicken Christmas day by the way. 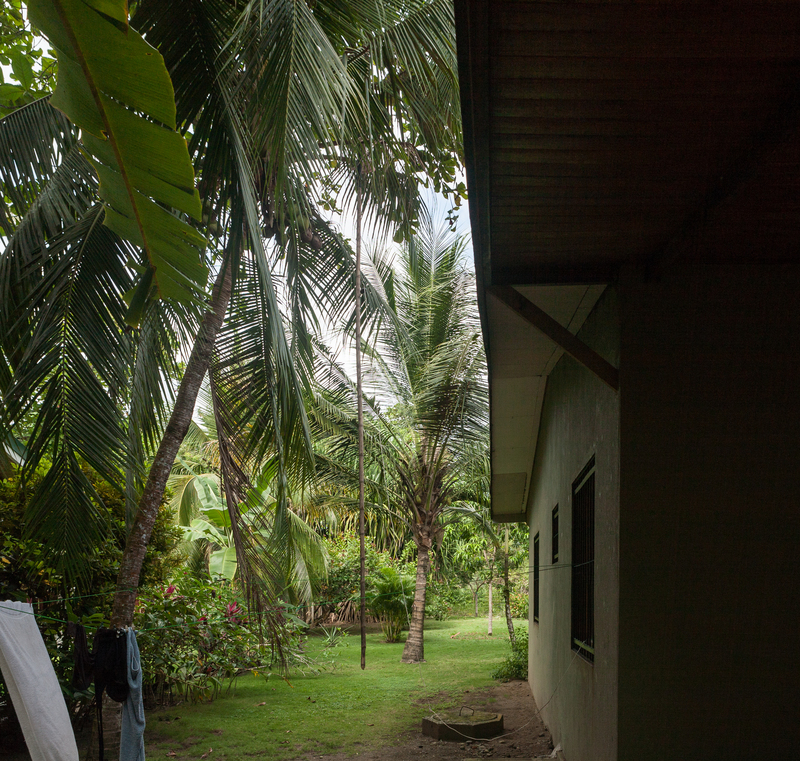 The extra benefit of it is we were able to get rid of 5 wheelbarrow loads of coconut husks in the process. 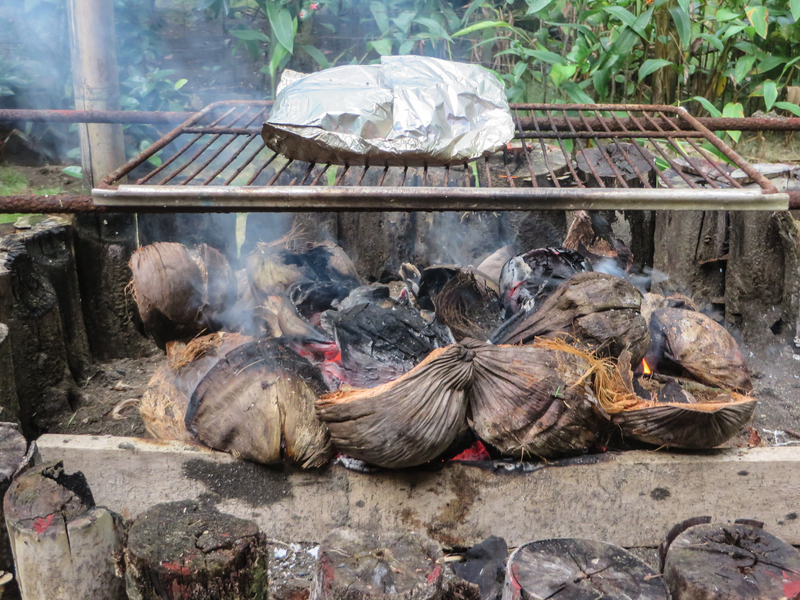 Testing out the barbecue with coconut husks as the fuel. We chose a project that allowed us to enjoy the incredible sunsets in style. One of the neighbours we were fortunate enough to become friends with was removing a teak tree that had become a hazard in her yard. 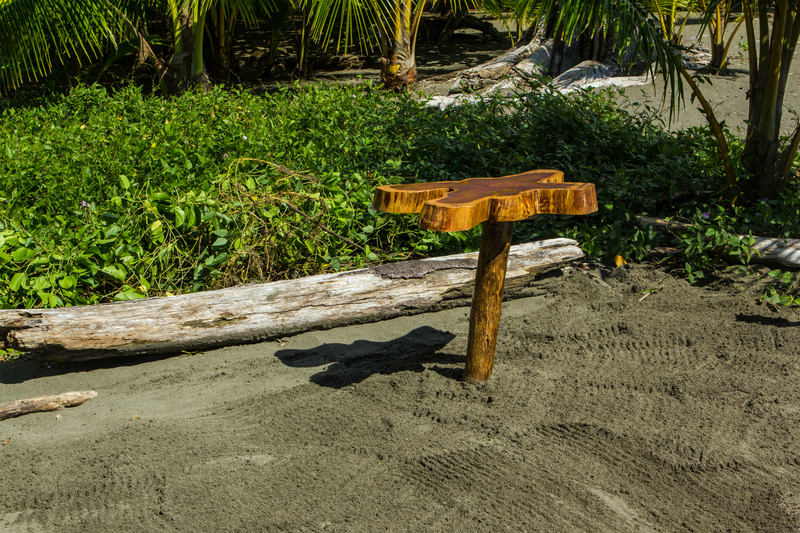 We were able to get a slice of it to use as a table top and scrounged a teak branch from the side of the road as a leg. After a bit of varnish we had a beautiful solid teak table for around $8US. A little project we chose to do so we could enjoy sunsets in comfort. The table gives me someplace convenient to put my camera for sunset photos. 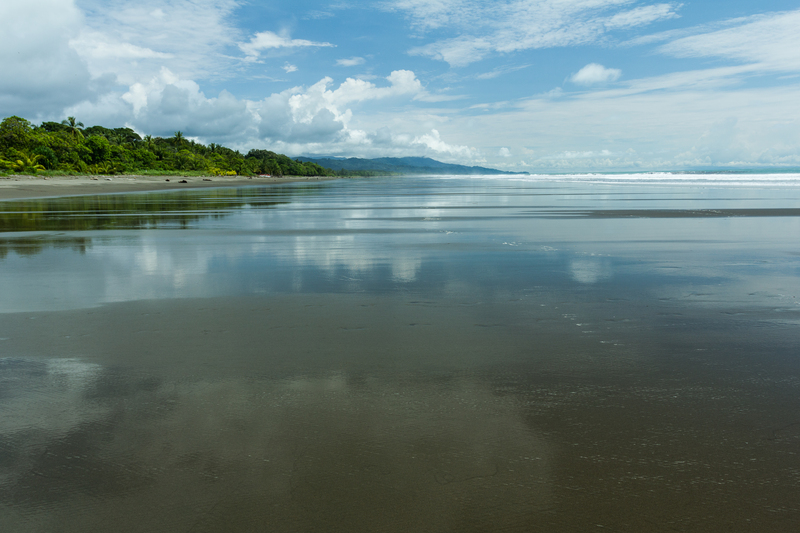 We have found we love this area and are truly looking forward to returning here after we take a couple of months to explore Panama. Thank you. We enjoy the table ever evening watching the sunset. I hope life is treating you well. Life is good. Hard to believe how quickly the last year went. Happy New Year to both of you!